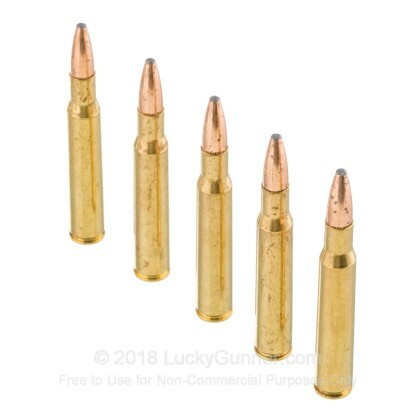 I decided to test this ammo against the Hornadey Whitetail loads in my Tika T3 30.06. after several trips to the range I found the groupings to be more consistent. Don't get me wrong both were very good for the money but when the decision came down on which I would use for my Montana Mule Deer it was an easy call. One shot and it was over ,the Federal Power- Shok took the heavy bodied boy down with no suffering. Great load at a great price. Lucky Gunner has always delivered quality & service with fast deliveries and fair prices! Quick and all I expected. Order was quick, and everything I ordered and expected. 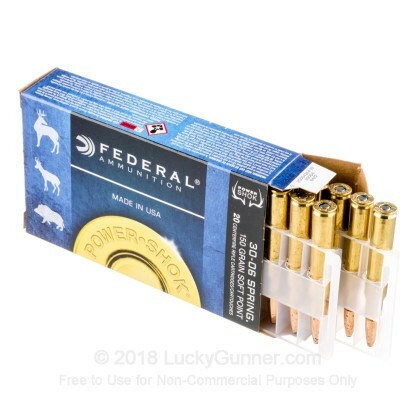 I have used this ammo in my Ruger 77 All Weather since I bought it new 17 years ago. I tried several different brands/bullet weights and this shot best out of my rifle. I was surprised and pleased since it costs so much less than "premium" ammo. I have taken 20+ deer with it and have never had to shoot a deer twice! Shots have ranged from 40 yards to 200 yards. 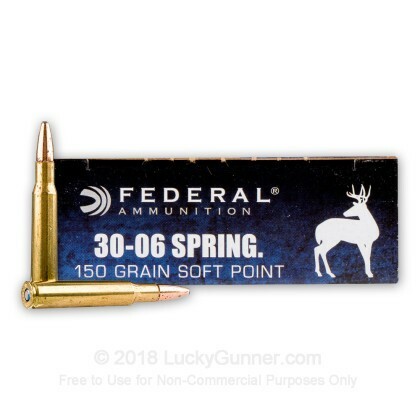 Don't let the price fool you, this bullet works great on deer sized game. Get 1/2 group @ 100 yards of the bags with first 3 shots. Next 11 went into the necks or shoulders of 10 Deer over the past 7 years. Filled my freezer many times over with this ammo. Missed one and had to use 2 in a big old doe cantering away at 420 yards on the last day of the season two years ago. I grazed her on the first shot, and pinned her shoulder on the second. She dropped on the spot. The 150 SP seems to do the Trick on Deer. USe a good rifle, with a 24" barrel and a decent scope and you will fill your freezer if you are in the right place at the right time. I have 6 rounds to go and I will have to open the second box. The Third is waiting also. I hope I live that long and can still enjoy Venision Meatloaf! 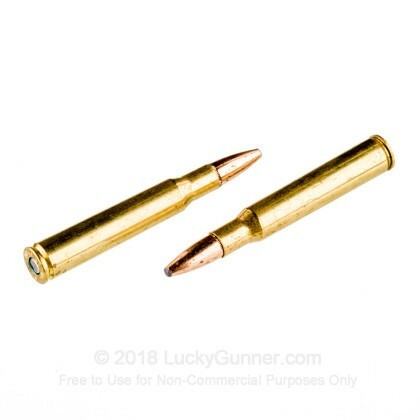 Q: Is this ammo safe to run in a 1945 Springfield M1 Garand? A: Yes, this ammo will be safe to run. 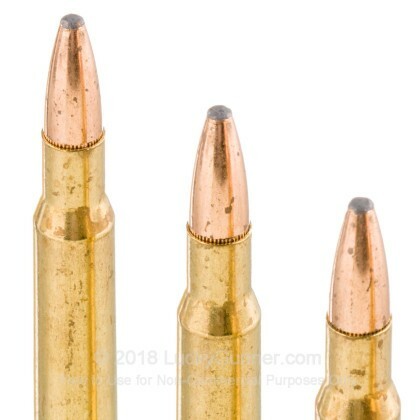 The incompatibility of most 30-06 ammo with the Garand stems from the weight of the bullet. Ammo at heavier than the 150 grain can cause damage to the operating rod assembly. 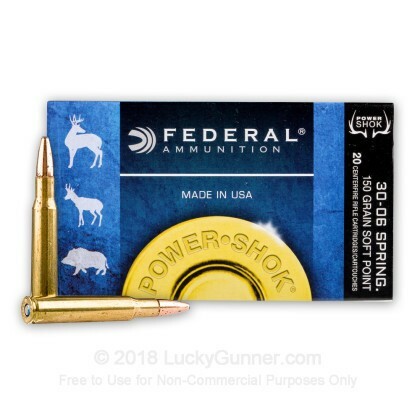 We also have this 30-06 - 150 Grain SP - Federal Power-Shok - 200 Rounds ammo in stock in a bigger quantity.